These videos illustrate the unique capabilities of the Daikin VRV system. See how you can achieve significant energy cost savings with the VRV-III's heat recovery system. The Variable Refrigerant Volume HVAC System is a relatively new technology developed by Daikin, the world's leading HVAC manufacturer. New VRV systems offer high levels of energy efficiency, as well as flexibility. They operate quietly and provide the user full control of the environmental temperatures. While traditional HVAC systems are often limited to one condensing unit, one compressor and one evaporator, a VRV system can be designed to specifically meet the needs of the building. One condensing unit can be connected to several evaporators, each of which are individually controlled. In a traditional HVAC system, the system kicks on when a room is too warm or cold; however, a VRV system constantly adjusts the amount of refrigerant being sent to each evaporator and takes advantage of existing heat or cool air in the building. This varying speed allows the system to work only as needed in each area to maintain the comfort level. The result is a custom-designed HVAC system that keeps all areas of your building comfortable at a fraction of the energy cost. 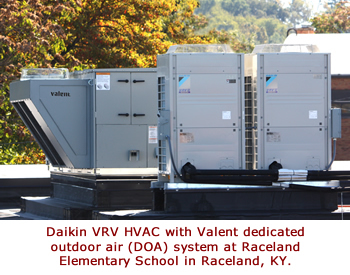 Click here to learn more about the Daikin VRV System.